CHAMBERS COUNTYAll of those who say that government should do this or do that, now has a real way to voice their opinion: they can run for office. Applications are now be accepted for the May 14 municipal and school board election. The filing period opened on Feb. 14. In Mont Belvieu, Positions 3, 4 and 5 on the city council are on the ballot. Currently holding the seats are Arnold Peters, Kevin Yeager and Tommy Grimes, respectively. As of press time, Arnold and Yeager have filed for reelection. Grime had not. Bob Reynolds will run against Arnold for the Position 3 seat. Brett Boudreux has filed for the Position 5 seat. In Old River-Winfree, there are also two alderman positions on the ballot. These are Position 2, held by Colleen Fontenot and Adonna Creel. Creel has already filed for a place on the ballot. As of 12 p.m. Feb. 22, Fontenot had not. The city will also be electing a mayor. 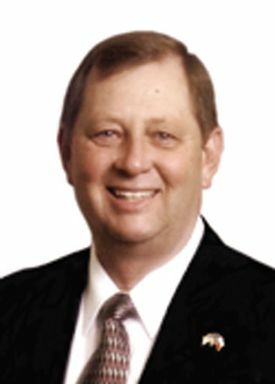 Incumbent Joe Frank Landry is running for reelection. There are two seats expiring on the Barbers Hill ISD Board of Trustees. George Barrera is running for reelection to Position 3 while Benny May will seek another term in Position 4. Those wishing to run for a seat on their city council or school board must file an application with the appropriate entity by March 14 at 5 p.m. The deadline to register to vote in the election is April 14. Early voting by personal appearance begins may 2 and runs through May 10. CHAMBERS COUNTYIn this weeks installment of this session of the Chambers County Sheriffs Office War on Drugs, we feature a familiar face, and also a suspected major supplier of Methamphetamine in Chambers County. Recent investigations have taken us to mid county and Old River-Winfree. On Jan. 12, at approximately 10:08pm, Street Crime Deputies were patrolling in the Indian Ridge Sub-division in Old River-Winfree. Deputies observed a white Buick car with Texas license plates leaving Indian Ridge. The vehicle was traveling south on FM 565, and failed to maintain a single marked lane. Deputies stopped the vehicle, and identified the driver as Keith Darnell McCullum (26 year old black male) of Katy. 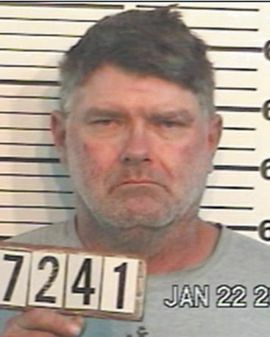 Upon Speaking to McCullum, deputies detected a strong odor of marijuana coming from his car. Deputies discovered a hidden compartment in the vehicles dash, which contained a clear plastic bag (containing 4 grams of suspected cocaine), several large clear plastic bags containing suspected marijuana residue, a drug smoking pipe, marijuana grinder, and razor blades. McCullum was arrested for Felony Possession of a Controlled Substance and booked into the Chambers County Jail. He was later released after posting a $15,000 bond. On Jan. 20, at approximately 11:55pm, Patrol Deputy L. Miller was dispatched to a disturbance in the parking lot of a convenience store at IH10 and FM 563, in Wallisville. The disturbance was between sisters, Dana Lynn Strange (36 year old white female) of Orange, and Donna Leigh Strange (32 year old white female) of Anahuac. The Strange sisters had begun arguing after arriving at the store in Danas vehicle. During a consented search of the vehicle, a small plastic bag, containing less than a gram of suspected methamphetamine, was recovered. A second bag of suspected methamphetamine was located in the jacket pocket of Dana Strange. The Strange sisters were both arrested for Felony Possession of a Controlled Substance, and booked into the Chambers County Jail. They were later released after each posted a $5,000.00 bond. On the afternoon of Jan. 21, Street Crime Deputies were conducting surveillance on a suspected illegal narcotics distribution house in the 7200 Block of FM 563 in Wallisville. The Chambers County Sheriffs Office had received numerous complaints about drugs being sold out of the house. Deputies had been watching the residence for months, and several drug arrests had been made on individuals leaving the residence. At approximately 4:37pm, deputies observed a maroon Oldsmobile leave the suspected drug house, and travel south on FM 563. The vehicle was stopped for a traffic violation (fail to signal left turn) as it made its way onto IH10. The driver was identified as Toby Ray Abeyta (35 year old white male), who lives at the suspected drug house, and who had been suspected as being one of the major suppliers of methamphetamine in Chambers County, southern Liberty County and western Jefferson County. Due to that past information, and Abeytas nervousness and elusiveness during the traffic stop, deputies asked for and received consent to search the vehicle. During the search, deputies seized approximately 2 grams of suspected methamphetamine from the front center console. Abeyta was arrested for State Jail Felony Possession of a Controlled Substance, and booked into the Chambers County Jail. Bond for that charge was set at $15,000.00. Based on the ongoing investigation into Abeytas suspected drug dealing and his arrest for Possession of a Controlled Substance as he was leaving his suspected drug house, deputies obtained and executed a search warrant on the residence. During the search of the residence, deputies seized 210 grams of suspected methamphetamine, over $4,800.00 cash, two digital scales, numerous small clear plastic bags, and various items of drug paraphernalia. Deputies also seized a .22 caliber rifle with a home-made silencer, and a .38 caliber handgun. As deputies made entry into the residence, they located the other tenant of the house, Alfred Thomas Kennedy (yes, the same Alfred Kennedy arrested and featured in a previous story). Kennedy was found sitting at a table, eating ice cream. At least this time it wasnt meth, as during his prior arrest. Controlled Substance was added to Abeytas arrest, based on the search warrant. Bond on that charge was set at $150,000. Abeyta was later released at posting bond, totaling $165,000.00. One of the people putting up money to help bond Abeyta out of jail was Zack Baty, who was featured in our first story. By their own admission, neither Abeyta nor Baty have a legitimate paying job. At press time Kennedy remained jailed. HIGHLANDSA man wanted for stealing copper near Dayton, has been identified by authorities as Lance Leon Mears, 25, of Highlands. 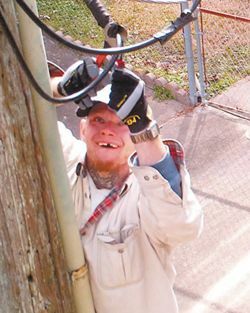 Last week the Liberty County Sheriffs Office released photos of a man on a pole cutting electrical wires, allegedly attempting to steal the copper. After the pictures were released the sheriffs office received tips leading them to a residence in the 100 block of Pin Oak in Highlands. However, Mears was not at home. A warrant has been issued for his arrest for the Dayton theft. The sheriffs office said that Mears is also suspected of other copper thefts in Liberty and Harris County. Mears has had other encounters with law enforcement. On Nov. 1, 2010 the Harris County Sheriffs Office arrested Mears on a charge of driving with a suspended drivers license. HIGHLANDS Sampson Masonic Lodge No. 231, annually honors a local citizen or group with their Community Builder Award for outstanding service to the community. This year, the award went to a couple well known in the community, Claudia and Bobby Birdsong, for their involvement in numerous civic causes and organizations. 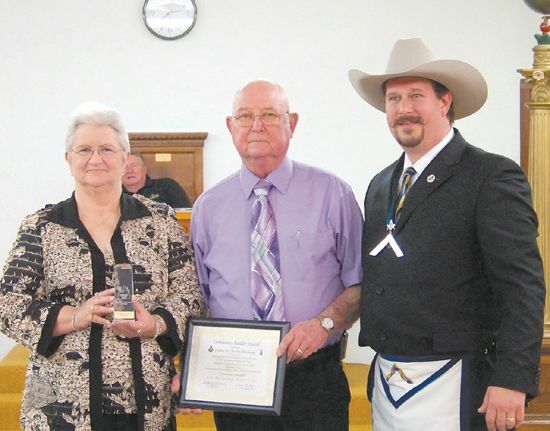 The award was presented to the Birdsongs by Worshipful Master Christopher Watson, in a ceremony held last Saturday afternoon at the Lodge, attended by family, friends, and Masons. Watson and members of the community that know the Birdsongs well spoke to the audience about their history of service to the community, and the friendliness and warmth they show to all. Speaking of their appreciation of the Birdsongs were Pastor Tim Edwards, Fire Chief Harvey Little, as well as Watson. Tim Edwards spoke about their service, reminding the audience that Jesus said the greatest is the one who serves. He recalled 14 years of Claudias service to the First Baptist Church members, taking care of people. He also noted Bobbys long service as a coach and sponsor of the Little League and Highlands Sports Association. Harvey Little recalled what great neighbors they are, as well as Bobby as a hunting friend, and colleague at the fire department. In his comments, Worshipful Master Watson noted that Claudia had served at the Church since 1986 as church secretary, headed the Food Pantry, supervised the Thanksgiving and Christmas baskets for the needy, and Share your Christmas for local school children. She kept in touch with local groups, such as Rotary, Sampson Lodge, area churches, and Pilot Club for needs of families in the community. Watson said that Bobby had retired from Lyondell Chemical, and been a Deacon at First Baptist Church since 1986. He has been a volunteer fireman for 17 years, serving as Assistant Chief and responsible for maintenance of the department vehicles. He partipates in the Fill the Boot Campaign, and annual HVFD BBQ. Bobby had worked with area boys and girls for many years coaching baseball and softball, and for 5 years has been Assistant VP of the Pony League baseball team. The Birdsongs family was present at the ceremony, including children Cindy Wilingham with husband Eric and their 2 children Courtney and Tyler; and son Billy with wife Melody, and their 2 children Logan and Morgan. After the awards ceremony, the attendees gathered for a social occasion and refreshments in the Sampson Lodge Building. CROSBY A town hall meeting that combined State Representative Dan Hubertys first public forum, and the school districts report on the school budget, was held last Thursday night at the high school auditorium. Several hundred people turned out, and although the crowd was civil, they voiced quite a few concerns about TxDOTs current plans for improvements on FM2100, and what the reduced school budget will mean to teachers jobs and classroom instruction quality. Both TxDOT and Crosby ISD expressed concern that reduced funding from the state would greatly curtail what they could accomplish. For instance, a much discussed widening of FM2100 from Crosby to Huffman, with left turn lanes and other safety features, is not going to happen in the near future, District Engineer Delvin Dennis said. Construction costs of $25 million, and land acquisition of $15 million put this project far into the future, he said. Dennis did say that some minor safety improvements would be implemented between now and September, and a study would attempt to lower the speed limit from 55 mph to 50 mph. When Rodney Foster pointed out that as many as 16,000 cars a day use this stretch of road, Dennis compared it to FM1960 with 60,000, saying it was a much more serious problem that he was dealing with. Several residents of Jackson Bayou, and Gena McMillan, who has a business on Kernahan, expressed concern about access to their properties when the railroad overpass is built. The TxDot engineers said that temporary widening would allow some access, but that other roads with alternate access would be blocked, but just for a few days. McMillan was not satisfied with this answer, and asked the public to contact her on her new website, www.visitcrosby.com. When mention of the new US90 was made, the audience burst into applause, and some told of the time saving this has meant to them. Huberty made the point about choosing between Needs vs Wants. He made the point that Texas does not have any money, and road and school budgets will be affected. The Legislature is now trying to fix a $27 billion dollar shortfall. He said that in March the state Comptroller will issue a new revenue forecast, and the Legislature must spend no more than this. However, the economy seems to be recovering, and sales tax collections are up, 11% in January for example. Huberty expects that the state will pull $3.5 billion from their Rainy Day fund to help with school financing. As a prior school board president, in Humble, Huberty said he has a passionate approach to education, and will be working on minimizing the funding cuts. Superintendent Moore pointed out that Crosby ISD has already taken a number of budget reductions, and they are now working on a budget for 2011-2012 that will be finalized when the states contribution is known, probably in August. The current Crosby ISD budget is $39.5 million, and this will probably have to be reduced by $3.9 to $5.3 million, Moore said. Because of the arcane funding formula that the state now uses, the only way to get more money for your budget is to pass a tax increase. Moore said that to save money, the administration staff is working fewer days, i.e. this is a salary reduction; reducing all travel; using resignations and retirements to reduce staff; and looking at job sharing as a possibility. 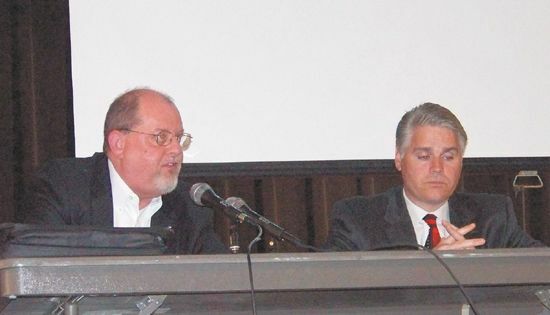 Huberty and Moore said that there will be another Town Hall meeting at the end of March, at the Newport Elementary. DAYTON State Representative John Otto (R-Dayton), a CPA serving in his fourth term in the Texas Legislature, has been selected by Speaker of the House Joe Straus to serve on two major House committees – the House Committee on Appropriations, which sets the budget for all state programs and agencies, and as Vice Chair on the House Committee on Ways and Means, which hears issues affecting tax policy in the state. Both committee assignments are considered high profile and have a significant impact on how the business of Texas operates. I am pleased that Representative Otto will again serve as the Vice Chair of the House Ways and Means Committee and as a member of the Appropriations committee, Speaker Straus said. MONT BELVIEUOfficials at Enterprise Products Partners LPs have confirmed that one person was killed at the Mont Belvieu facility following the Feb. 9 explosion and fire. Company spokesman Rick Rainey said that the body of Richard Shaw was found on Feb. 10. Shaw was a contract worker at the plant, employed by Turner Industries of Baton Rouge, La. The fire started around 12:15 p.m. in the west storage facility. Witnesses at the plant said some pickup trucks in the parking lot exploded from the heat. Witnesses as far away as Crosby also reported hearing the sound of the explosion. City officials said that they did not order a shelter in place, and they did not believe there was a public hazard. State Highway 146, which is adjacent to the facility, was closed until late in the evening in both directions while fire crews battled the blaze. He later added that they are looking at a possible pipeline failure as the cause, but that they would know better in the following weeks as they are joined with inspections from the federal Occupational Safety and Health Administration. A witness who was about 50 feet from the fires ignition source said he believed the Shaw was working on a pipeline when the fire started. HIGHLANDS Chamber president Phillip Morris was the host and keynote speaker at last Thursdays annual Installation Banquet, held at the Eagle Point complex in Mont Belvieu. About 75 members of the Chamber, new officers and board members, and friends of the Chamber attended the gala event. President Morris reviewed the accomplishments of the Chamber in the last year, and set goals for everyone for the coming 2011 term. He also introduced and thanked the sponsors of the 2010 Jamboree with appropriate certificates. 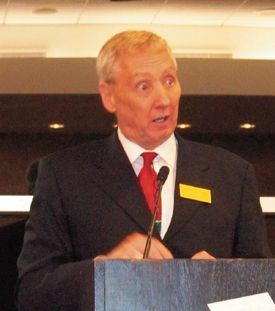 In reviewing 2010, Morris noted that the Jamboree made money for the Chamber, that member participation on committees had increased considerably, and active members had increased from 32 to 94 in the last 1 1/2 years. He also gave credit for much of this to the hiring of Reba Rachall as the Executive Administrator of the Chamber. 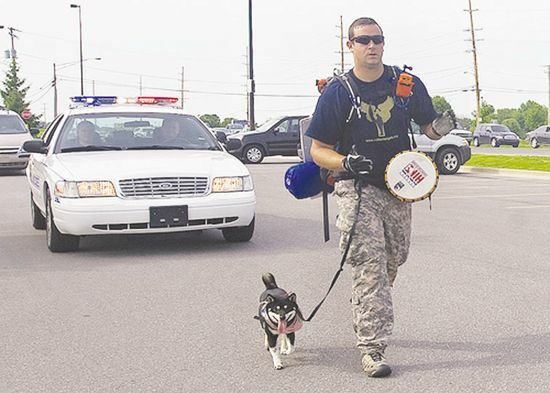 CROSBYWhen Iraq War veteran Troy Yocum visits Crosby next week as part of his 7,000 mile-hike across America, he will not be alone. Drew Intermediate student Hannah Thomas will be walking alongside him. Thomas has raised more than $300 for Yocums Hike For Our Heroes. Making up flyers and letters, Hannah began soliciting areas businesses, the fire department and EMS. Pledges began to arrive. Community service is nothing new for Hannah, who picked up the lesson at home. Her mother said that each year the family provides gifts and food for families at Christmas. While Hannah has helped in her familys community service, her mother said this is the first time she has taken on a project like this by herself. To thank Hannah for her support, Yocum has invited her to join him on his hike. Kelly said that Hannah would meet Yocum at the intersection of Hwy. 90 and Beltway 8 on Feb. 21 at noon. The pair will then walk to Crosby, ending at the high school around 4 p.m.
I would love to see the people out on the streets cheering and supporting them as they walk down 2100, Kelley said. The day does not end at 4 p.m. as Yocum hopes to put Crosby in the record books. supporters will attempt to break the Guinness World Record for the largest group to run a race barefoot. The current record is around 306 people. The distance to run is 100 meters. The Barefoot Race will start on the football field at 6 p.m. All runners must be barefoot; it will be a mass start. T-shirts will be sold at the stadium prior to the walk. All proceeds will go to Wish Upon a Hero Foundation (www.wishuponahero.com). These funds are used to help military families in need. Spectators will be encouraged to donate as well. Those in the race can have people sponsor them in the race for more donations. People can even donate online between now and the event. HIGHLANDS/ CROSBYCopper thieves continue to show their have no respect for person or property. Last week St. Jude Thaddeus Catholic Church became the latest victim of the thieves. Father John Zabelskas said that on Feb. 10 a person, or persons, stripped the copper from two air conditioning units that service the classroom. Zabelskas estimated the loss at $12,000. St. Judes is not the only charitable organization forced to contend with copper thieves. In November, thieves stole five 5-ton air conditioning units from Churches United in Caring(CUIC). Since 1983 CUIC operates a food bank, assistance center and thrift shop at 516 Church St. The Crosby Fair and Rodeo Association, which has given tens of thousands of dollars in scholarships to area youth has also been victimized in the past few months. The Liberty County Sheriffs Office is looking for a copper theft suspect, who is believed to have been responsible for thefts in both Liberty County as well as east Harris County. He is described as a white male, of medium height and weight, with red hair. He has a skull tattoo on the front of his throat as is missing a front upper tooth. MONT BELVIEUOfficials at Enterprise Products Partners LPs facility in Mont Belvieu are attempting to assess the damage after multiple explosions rocked the plant Tuesday afternoon. Company spokesman Rick Rainey said the fire started around 12:15 p.m. in the west storage facility. Witnesses at the plant said some pickup trucks in the parking lot exploded from the heat. As of Tuesday night, Rainey said that one contractor was still missing. No other injuries were reported. The roadway of FM 1942 was closed and all access to the plant by the public. Witnesses as far away as Crosby reported hearing the sound of the explosion. Enterprise Products operates a natural gas liquids fractionators, propylene fractionators, butane isomerization units, octane enhancers and import/export terminals at the facility. City officials said that they did not order a shelter in place, and they did not believe there was a public hazard. State Highway 146, which is adjacent to the facility, was closed in both directions while fire crews battled the blaze. Rainey said that for the time being they will let the fire burn itself out. He added that it was too early speculate on the cause of the fire. A witness who was about 50 feet from the fires ignition source said he believed two men were welding on a pipeline when the fire started. One man stated he got away when a popping noise started and he did not know what happened to the other worker. Barbers Hill ISD Spokesperson Dr. Gayle Woodall said that they allowed parents to pickup their children. Students were also kept inside building and not allowed outside for recess, she said. The high school also released students at 1:30 p.m. The Barbers Hill school complex is between seven and eight miles from the facility.